Protists are single-celled eukaryotes (which are organisms with a nucleus). The term Protista was first used by Ernst Haeckel in 1866. The protists are not a natural group, or clade, since they have no common origin. Like algae or invertebrates, they are often grouped together for convenience. 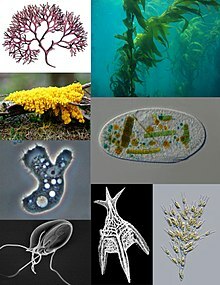 The term "protist" includes microorganisms from several distantly related phyla. Some are autotrophic (which means they make their own food by photosynthesis), and others are heterotrophic (which means they eat organic material).